Florida 527 is a 8.54 mile long discontinuous route with two distinct sections between Florida 482 (Sand Lake Road) at Pine Castle and U.S. 17 & 92 (Orlando Avenue) at Harmon Avenue in Winter Park. A 1.53 mile portion through Downtown Orlando was turned over to the city. This includes the one-way couplet along Rosalind / Magnolia Avenues north and Orange Avenue south from Lake Lucerne to Colonial Drive (U.S. 17-92 & Florida 50). Florida 527 ends from the south at Gore Avenue, and resumes north from Florida 50. The state road formerly extended 0.738 miles northeast from U.S. 17 & 92 (Orlando Avenue) through the Winter Park city center to SR 426 (Fairbanks Avenue). This portion of Orange Avenue is unsigned County Road 527. 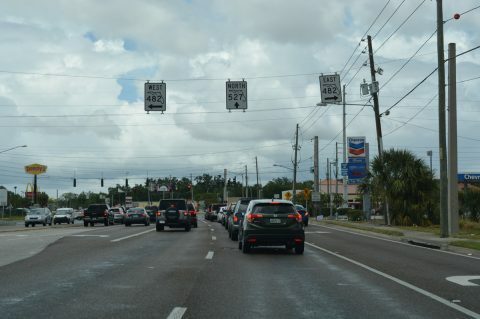 Additionally the two block section of Fairbanks Avenue (SR 426) leading 0.33 miles east from Orange Avenue to New York Avenue remains a part of SR 527. CR 527 (Orange Avenue) transitions to SR 527 at SR 482 (Sand Lake Road / McCoy Drive) in Pine Castle. Photo taken May 5, 2018. County Road 527 (Orange Avenue) extends south from SR 482 (McCoy Road) as a mostly unsigned route to Osceola County and Osceola Parkway (CR 522). South Street flows west along side Florida 408 (East-West Expressway) from Lake Underhill to Rosalind Avenue north. Exit 11A from the toll road west ties into South Street just ahead of former Florida 527 north. Photo taken 09/08/18. Remaining Florida 527 shield still posted for Rosalind Avenue north along South Street west. Florida 527 followed Rosalind Avenue north to Florida 526 (Robinson Street). Photo taken 09/08/18. Rosalind Avenue flows northbound only between Lake Lucerne and the transition to Magnolia Avenue ahead of Livingston Street. Photo taken 11/05/06. South Street advances by the Dr. Phillips Center for the Performing Arts to intersect Magnolia Avenue. Magnolia Avenue parallels the one-way couplet of Rosalind and Orange Avenues (former SR 527) north to Livingston Street. Photo taken 09/08/18. Approaching Orange Avenue (former Florida 527) south on South Street west. Florida 527 south exited Downtown by way of Lake Lucerne between Anderson and Gore Streets. Photo taken 09/08/18. Orange Avenue passes underneath the East-West Expressway at Lake Lucerne. South Street continues west to ramps for Interstate 4 and Amway Arena. Photo taken 09/08/18. Pine Street east at Orange Avenue (former Florida 527) southbound. 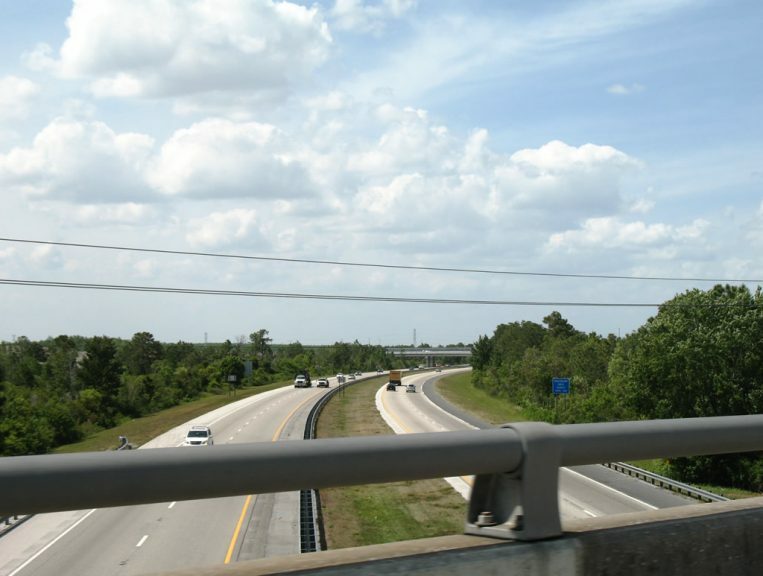 An Interstate 4 trailblazer directed drivers southward to South Street. Photo taken 07/29/06. Princeton Street (CR 438) links Interstate 4 with SR 527 (Orange Avenue) at the Loch Haven community in north Orlando. Orange Avenue travels south through the antique district while Princeton Street continues east to U.S. 17 & 92 near Harry P. Leu Botanical Gardens and other cultural attractions. Photo taken 08/16/08. Florida 527 leads northeast from Princeton Street into the city of Winter Park and southward to Lake Ivanhoe and Downtown Orlando. Photo taken 08/16/08. 07/29/06 by AARoads and Justin Cozart. 11/05/06 by AARoads and Justin Cozart.